The book draws together the economic literature relating to the supply of land for development. The standard view appears to be that the owners of land have no interest other than to allow their land to be used for the activity which would yield the highest income. But in reality this is not so and the book's aim is to demonstrate this, to set out the reasons and to show the economic effects of the fact that landowners have other motives. The book covers the supply of land for urban development and shows how land has characteristics which differentiate it from other factors of production which will also affect its supply for some uses, e.g. land is fixed in location and its price and value are inseparable from where it is. New light is cast on the market for land (by concentrating on the supply side), and on land use planning (by taking an economic viewpoint). Chapter 1: Introduction: The Market for Land and Property. The development of a theory of the supply of land. Chapter 2: Land Values, Rents and Demand. Planning controls and rent theory. Chapter 3: Coping with Changes in Demand. Capital longevity and the asymmetry of change. The process of change in the housing market. Chapter 4: How Efficient is the Property Market?. The economic concept of efficiency. Chapter 5: Market Inefficiency: Causes and Consequences. Why the property market is imperfect and inefficient. Price determination and the theory of the core. Chapter 6: The Supply of Land for a Particular Use: Speculation and Uncertainty. Chapter 7: The Supply of Land for a Particular Use: Occupier Performances and Residential Attachment. Chapter 8: The Ownership of Land. Tenants, owner occupiers, and the supply of land. Chapter 9: Land Ownership, Politics and Society. Society and the ownership of land. Alternative forms of ownership and tenancy. Chapter 10: Ownership and Control: Monopoly. Monopoly rents and wine production. Monopoly rents and shopping centres. Chapter 11: Ownership and Control: Minimum Rents. Minimum rents in an urban environment. Chapter 12: Information, Uncertainty and the Property Market. Modelling the search for information. Searching for housing in practice. The developer and land supply restriction. Chapter 13: Land Availability and Land Banking. Land banking by private firms. Chapter 14: Contiguity: Site Assembly. Chapter 15: Contiguity: Compulsory Purchase and the Scale of Development. Compulsory purchase and the speed of acquisition. Scale economies, acquisition costs, and history. Chapter 16: Contiguity: Land Reallocation and the Price of Land. Size of site and the price of land. Chapter 17: The Taxation of Land and Development Gains. Economic theory and taxes on development. Land taxation in recent British history. Chapter 18: Annual Taxation and the Nationalisation of Land. Property taxes and the rates. Chapter 19: Themes and Changes in Perception. 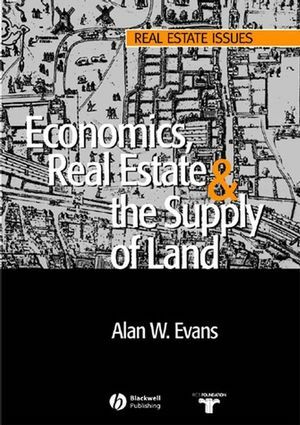 Excellent in the way it brings together in a coherent whole, various approaches to the analysis of the supply of land for development. The issues covered are pertinent for both practitioners and academics in providing a useful theoretical framework based on sound economics. The book is well written and enjoyable to read. Journal of Property Investment and Finance, September 2005.